We didn't have a Nativity scene down here in Haiti, but we did have a lump of clay. 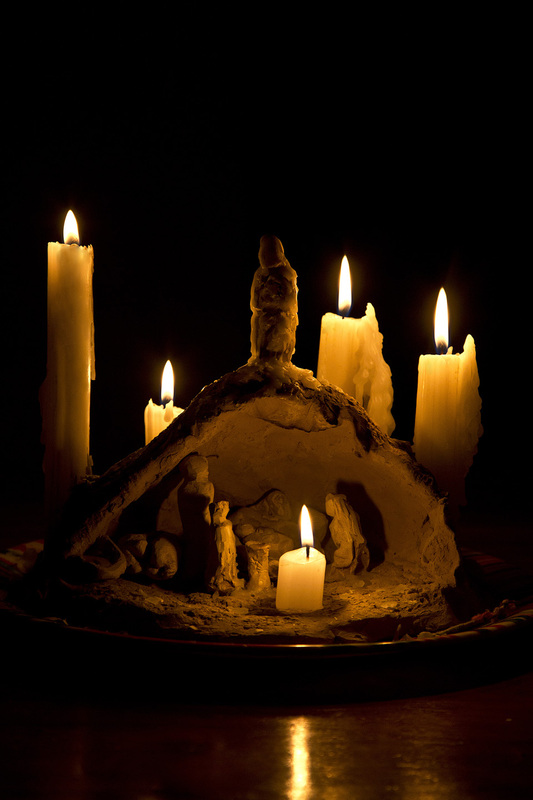 I thought it would be perfect to stick 5 candles in that lump of clay, remembering over the weeks of Advent that we are all still in the hands of the Potter, being formed and shaped. Kari came out and looked at my 'lump' idea and said, "It's ugly. Do something and make it pretty." So we did. I pushed out that lump of clay and made a Manger, and then with some broken pieces of dried clay from last year, Abby and I began to carve out our scene. There is Mary kneeling, baby Jesus bundled, Joseph standing, the sheep curled up asleep, the little drummer boy and even an Angel keeping watch. It won't last forever as there is no kiln. It's more like dry mud than anything, baked in the Sun, so it crumbles easily. It's passing away just like the rest of us in this old world. But there's one thing it certainly is.... it's pretty. It adorns our table as the centerpiece. If God gives us another year, I'll make another, and I'll form the Manger to be the cupped hands of God, because at least that much is lasting. He is always shaping and making us into something holy, something beautiful, and we are, always, in His hands. The government here seems to be standing on sinking sand. With all the hasty remarks that have began to take flight, please pray for peace and for the memory of the words that aren't meant for such to be forgotten and laid to rest in an unmarked grave. Fools are best to keep themselves silent, lest they open their mouths and remove all doubt. But it’s for those with wisdom and understanding to speak, using words with restraint. 'The words of a man’s mouth are deep waters, but the fountain of wisdom is a bubbling brook.’ Being slow to speak, yes, but sharing the choice meat that God gives, that’s important. The Bible says that death and life are in the power of the tongue. We’re supposed to sharpen one another, keeping the shields well-oiled and fit for battle. Those conversations, if not sought after, should at least be embraced as something precious, remembering there will come a day when the giver may well be the receiver, thirsty and in much need of a drink from the well of Christ. All our thirsts will one day be quenched in the river, and I hope we will sit along the grassy bank and share some of the fruit from that miraculous tree. Until then, remember to Whom it is we pray, with humility and reverence and relationship, and share Him with the waxing world.